Getting ready to try it. I think making the folder is the key. Great site. When I say that I have a PowerPC G5 … then most folks will already know what my problem is. 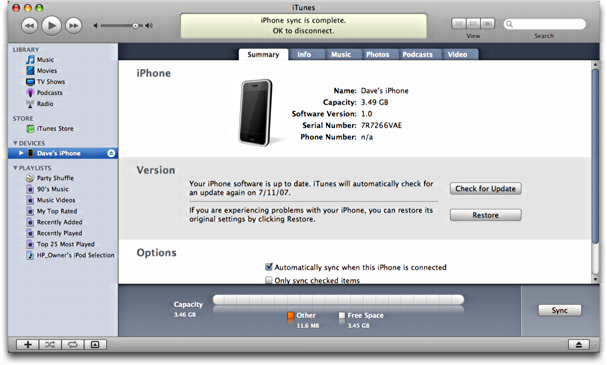 So, how do I get my iTunes (9.2.1(5) ) library on my iPhone 4? A PowerPC G5. Yeah, had one of those. Eons ago. I am afraid it’s too ancient for modern Mac OS X to run on it, therefore you can’t get the latest version of iTunes (if any?) so you’re kind of out of luck with your iPhone unless you get some more modern hardware. Sorry. Dave Taylor, thanks for the reply: I read online that my iMac is obsolete. I followed your instructions for transferring music from my iTunes library to my iPhone 5 and it worked beautifully. Thanks a million! thank you so much!! I synced my ipod by accident and lost all of my music. such a bummer; you saved my music life. It was a little different for the iphone 5, but fairly easy. Thank you! Yours was the one instruction from how to move playlists from iTunes 11.0.2 to iphone 4 that made sense to me. I made the new playlist as instructed (which wasn’t ideal since this is actually 6 playlists – hypnosis tracks etc for different birthing purposes..TMI – i get to music tab, check synch music – then receive this message “Are you sure you want to remove existing music, movies, TV shows, books, and tones from this iPhone and sync with this iTunes library?” and the sub choices – entire music library, selected playlists…, include music videos etc are not selectable. Two hours later I am tearing my hair out. My client – giving birth in a few weeks will be very grateful and so will I. Just want to thank you for helping me transfer files from my PC to my iPhone may God bless you and prosper you. That explanation was so competent and to the point. It leads to a question, though< why does it have to be so difficult that we need a smart expert to explain it to us? Thanks for that explanation!!!! My computer reconizes my iphone but not itunes, no summary widow pops up. Any idea what is wrong? My wife and I just got iPhones – the playlist worked like a charm. 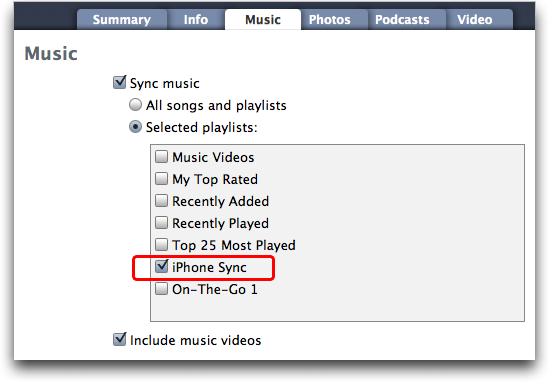 Thank you for the great instructions on syncing the playlist to our phones. I will continue to monitor your informative site if I have any more questions or problems. Thanks again. Thanks Dave, this is the second time I’m using these helpful instructions. The steps varied a bit for the iPhone 5 but I was able to get the selected songs in a playlist and then on my new phone. Today I wanted to add a couple more tracks and after searching for an hour to make this happen this link popped up again and I was able to figure it out and add two more songs to the playlist. Thank you for this link! Whew. Instructions worked perfectly. Thanks so much for the help. Awesome! Thanks. But it is even more utterly awesome that Apple has implemented this awkward and anti-intuitive interface on iOS devices. apple, time to deliver de DECENT interface, like the Mac interface. I want to be in control, not the other way round. I want to see the iOS device as I see a Mac, with all its files and folders, and I want to move, copy, paste and delete stuff as I do in a Mac. And I want a factory-jailbroken iOS device, of course. Because it is my stuff. Or else competitors will take advantage! to find my tutorial on the subject! this was very helpful but I don’t want to delete my other things… PLEASE HELP!!! Dave – Many Thanks!! This helped a lot, now I can import as need be. Can you please explain in plain english. As if you were explaining to a grandmother that has never used her iphone before. What EXACTLY do i push on my phone, etc. not slang words. I followed your instructions & the sync process erased all my current songs on iPhone & replaced by the songs in the playlist 🙁 I wanted to add more songs, not to replace hundreds of current songs by just a few new ones!!! Could you please help? but yor idea had not work …. very hepfull. Thanks a lot. I have created playlist to transfer songs from laptop to my iPhone ..
After this step I m getting any further procedure. My daughter downloaded itunes onto our computer when she got her ipod. At that time we had internet. We no longer have internet, but the itunes account/library is still on our computer. I recently got an iphone4 and want to put some music on it. Can I do that using her itunes account/her library of songs and if so can I do it with no internet connection? Thanks Dave – your instructions were spot on and I am loving life even more – music truly is medicine for the soul! I want to thank you from the bottom of my heart. You are the best!!!!!! I tried doing it myself and got some music, but then started having trouble since I didn’t want everything from my computer. You have been so helpful. I tried other sites and one gave a really nasty comment about reading the manual which I don’t have. I tried downloading the manual, but couldn’t find the information. I am a retired teacher and you showed me how to do what I needed just like a teacher. You are my iHero. This worked for me perfectly. Thank you so much. I’ve been struggling with this for ages..creating a synch playlist worked for me. Thanks SO MUCH!! have been trying to work it out for a long time!! really well laid out and easy to follow, thanks again so much!! yes after 10yrs lol i finally got it..thank you dave! Thanks for that but I still had problems until I realised (English spelling)that every song needs to be ticked to be copied. Thank you though. It did sort my problem. Thanks, someone who understands the importance of clear concise instructions for those over 40 trying to learn new tricks! I have music! i dunno, i hate itunes. being used to the simple pc drag and drop option i just use this program called Phonestick. it lets you mount your iphone or any idevice and use it like a simple usb device. TRUST ME it’s better then this. Put me on your list as yet another fan. Very helpful.